TLC presents laser entertainment with a twist – laser performers that JUGGLE and BOUNCE laser beams! Bending laser beams is a great analogy at corporate meetings; shaping the future! Laser shows from TLC Creative always include a level of visual creativity missing from many laser shows these days. 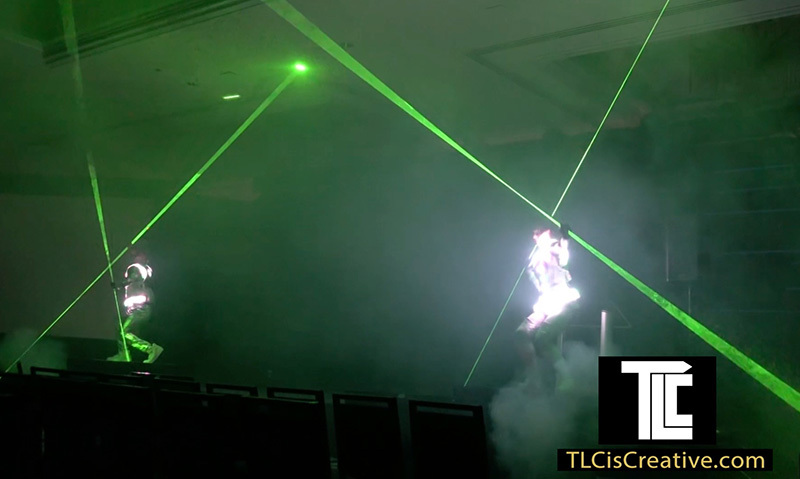 With decades of laser show experience, TLC knows how to FOCUS the audience energy to deliver spectacular results. A motivational opener becomes an unforgettable experience, condensing ideas and messages into a kick-off show experience that gets everyone pumped up. LIGHT BENDERS work the lasers with ‘harp’ effects, drum / synchronized effects, and ‘GRABBING THE BEAMS’ and BENDING THEM! Eye-popping visual excitement that the video cannot capture, how powerful the show is in person. TLC provides laser entertainment of all kinds, from the beautiful projection displays of VISUAL MUSIC created with laser light, to aerial laser shows of every size. Interactive LASER MAZES for ‘entrapment’ type walk-thru experiences, and laser cones that create infinite hallways of light, TLC creates special displays with laser light. Imagine original laser experiences and TLC can bring your vision to life. The SPACE LASER CANNON is dazzling audiences with very high power displays that are like nothing on earth.